At the time I was living in The Netherlands. This letter, without any street address or zip code, had been forwarded to my new Dutch address from the Italian post office 1300 km (800 miles) away. The letter was from a complete stranger in California who had received one of my poems called Lynn’s Visit. She wrote that she belonged to a woman’s group and, during one of their meetings, this poem had been shared with the group. The poem was about how I had been searching for courage when I found it in a woman called Lynn who was disabled. Oddly enough, the letter writer was also named Lynn, and she too suffered with a debilitating disease. I cried when I read her words, for her search for purpose had ultimately come full circle back to my own search for meaning. Instantly I understood why I am writing poems. They are the seeds of my life. And like a tree that, with the help of the wind, simply spreads its seeds, I scatter poems so that they may grow or lay fallow, burn or bare fruit. I bare these seeds and God (or the Higher Self), in turn, transforms them into meaning. This story about the poem and Lynn’s letter demonstrates how an unconscious act can bear fruit in a way that is unexpected and, while profound, elicits no fanfare. Of course, we can also make conscious choices to change the world in our own quiet way. For ideas of how, you might want to see A Path Appears. Husband-and-wife team Nicholas D. Kristof and Sheryl WuDunn have written a book that describes some of today’s most successful local and global initiatives to fight inequality, and they provide a roadmap to becoming a conscientious global citizen. They inspired me to adopt a hero rat to sniff out land mines! 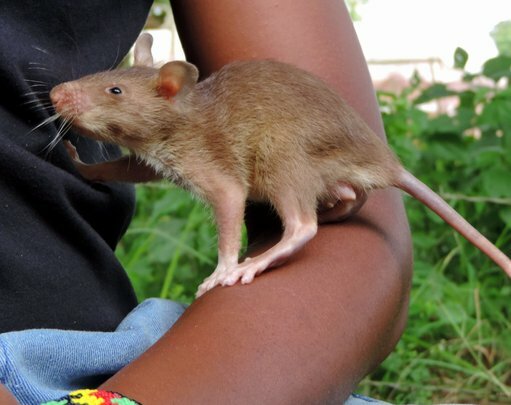 Who knows what significance that little rat will have in saving someone’s life or limb? All I know is this: What that rat and I can achieve is far beyond anyone’s imagination. For those who are interested, you can read the poem Lynn’s Visit.